Even though patients would like to believe that clinicians have all the answers to their medical problems, clinicians often face questions and uncertainty when evaluating patients. 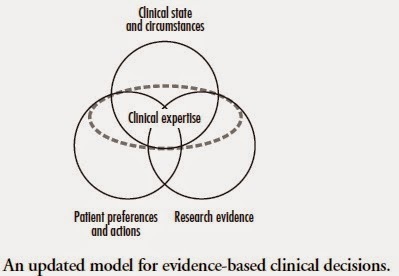 EBM urges the clinicians to utilize best available evidence in light of their clinical expertise and patient preferences. This requires skill and time: to identify the question, look for evidence in the literature, evaluate the article for its validity and applicability and finally be able to apply it to the patient in front of the clinician. These short blog posts are the work of significant evidence search and appraisal by geriatrics clinicians – fellows and faculty in the Department of Geriatrics and Palliative Medicine at Icahn School of Medicine at Mount Sinai. They will start with a short description of a geriatric patient case (without patient identifiers), followed by a clinical question. This question will be addressed in subsequent paragraphs by a systematic search of the literature and appraisal of the article/s, finally ending with how patient care was impacted by the practice of EBM. I hope you enjoy them and find them useful. Feel free to post your comments.